Fr. Adam Otterbein, C.Ss.R., President of the United States Holy Shroud Guild, and, with Fr. Peter Rinaldi, its co-founder, died on June 9, 1998 in Saratoga, New York, after having been in failing health for some while. He was 82. He was buried on Saturday June 13 at the Redemptorist Cemetery at Saratoga Springs, New York. Fr. Adam was professed a priest on August 2, 1936 and ordained June 21, 1941. My most vivid Fr.Otterbein memory is being driven as a back-seat passenger by him in the tiniest of Fiats through Turins crowded streets, with Fr. Rinaldi as navigator and Fr. Adam, with a patience greater than Jobs, repeatedly needing to prompt You want a left, Father? 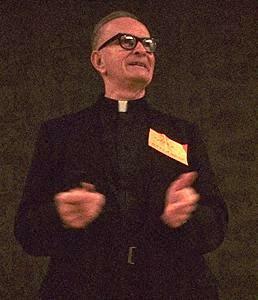 as Father Peter concentrated more on animated conversation than on any direction giving. It was characteristic of Fr. Adam to be the ever-practical and pragmatic Martha to Fr. Peters Mary of Luke 10: 38-42. Fr. Kim Dreisbach said of him: He was the glue that kept the Holy Shroud Guild together and whose organizational skills, fidelity to empiricism and competence in many skills. played a major role in promoting and investigating the Shroud. If his co-worker Father Peter Rinaldi, SDB opened the doors for the 1978 investigation by STURP, it was Father Adam who made certain that the necessary support and organizational skills made entry through those doors a reality. Father Adam also played a key role enabling the award-winning Shroud documentary The Silent Witness to come into being. Cardinal Anastasio Ballestrero, Cardinal Saldarini's predecessor as the Shroud's custodian on behalf of the Pope, died on June 21 of this year, at the age of 84. It was he who presided over the STURP testing in 1978 and the Shroud carbon dating in 1988, in the latter instance receiving much criticism for his acceptance of the scientific findings on behalf of the Catholic Church. 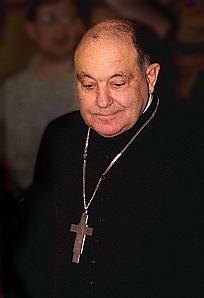 Received into the Carmelite order at the age of 16, Anastasio Ballestrero was ordained a priest in 1936 and after initially serving as Bishop of Bari he was appointed Archbishop of Turin from 1978 to 1989. Among Turins Cardinal-Archbishops Ballestrero stands out rather as a Pope John XXIII character, with much the same build and man-of-the-people air. Photographs taken at the time of the taking of the samples for the radiocarbon dating show him resting with his elbows on the Shroud, and there have long been rumours that he personally did not believe it authentic even before the carbon dating. Yet last year, in newspaper interviews, he was reported claiming that he believed in the Shrouds authenticity, also that freemasonry had played a part in recent attempts to discredit both it and the Catholic Church as a whole. Dr. Rivero-Borell Vasquez was founder-president of the Centro Mexicano di Sindonologia, the British Society for the Turin Shrouds Mexican counterpart, and well represented with delegates attending the Turin Congress. He died on 17 October, after a long struggle with bladder cancer. Adolfo Orozco of the Centro Mexicano writes: His last wish was that we continue the search for the message that Jesus Christ put in this cloth [i.e. the Shroud]. In a future time we will give you a more detailed account of the work that Enrique made to study and spread the different studies, medical, scientific, historical, etc. and his beautiful sculpture works of Christ in the cross, and other artistic works made by him. The Society extends its condolences to the Centro Mexicano at this time of their loss.